Commodore Amiga A500/600 Tank Mouse - Spares Or Repairs! S elling as spares or repairs as only goes left and right. Slight yellowing to case as per usual. 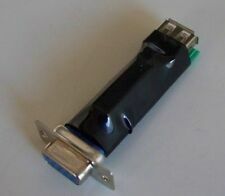 Features DB9 connection for use with Classic Amiga computers: A500, A500 , A600 , A1200, A1500, A2000, A3000, A4000, A4000T. 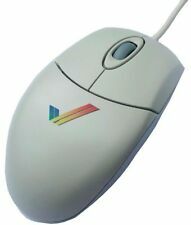 Classic Amiga Optical Scroll Mouse. no driver needed. The standard features will work with just plug and play like the original Amiga mouse. Commodore Amiga A500/600 Tank Mouse - Excellent Condition! R ecently dismantled cleaned and anti bac’d. Condition is good and is not in the usual yellow colour. The plug end is a little discoloured. Original Commodore Amiga Tank Mouse tested & working. Condition is good and not yellowed compared to many. Thanks for looking. Commodore Amiga A600 Mouse - Fully Working! Recently dismantled cleaned and anti bac’d. Usual slight yellowing to case. USB to 9PIN PS2 mouse convertor Any Amiga. Commodore Amiga Compact USB Mouse Adapter - Made in UK. This model fits the Amiga 600 mouse port leaving plenty of space so it will not block joystick port. Compatible withALL Amiga Computer Models and theCD32. Quickly switch between Amiga and Atari mode using two jumpers. No more cleaning gunged up rollers - bin that clunky old 80's mouse and give your Amiga or Atari ST a whole new lease of life! The middle mouse button works with programs that support it, such as Dir Opus 5.x. Commodore Amiga A600 with Mouse, Joystick, Game, Manual and Discs. The machine works as can be seen in photos, the screen did flicker a bit so the wire may be a bit temperamental but the game worked without flickering so it is definitely functional. Both the mouse and joystick work. The powerpack is a bit discoloured but working. As i am completely unfamiliar with this computer i am selling it sold as seen, but happy to answer any questions you have. Postage will be insured for final price. Commodore Amiga or Atari ST. Wireless Optical Mouse with an Adapter for. This is an Mouse for Atari and Amiga computers, boxed in good condition. Tested and working. Very easy to use. Simply plug an Amiga mouse into one port and a joystick in the other. Then plug the switcher into your computer. Tested on an Amiga but may work on other computers such as the Atari ST etc. Item in good clean working order. USE OF THE INTERFACE Adapter automatically detects the type of the device connected which is signalized by the LED as follows: - LED dimms every 2s. – mouse, - LED dims twice each 2s. – keyboard. To perform it we need press simultaneously pad or joystick buttons as follows: - Button 1 Button 2 left direction and hold it for 10s (LED starts flashing quickly) now we have 15s. commodore amiga 600 bundle ! games! joystick ! mouse ! powerpack ! vintage ! Commodore Amiga 600 for sale. Quickly switch between Amiga and Atari mode using two jumpers. No more cleaning gunged up rollers - bin that clunky old 80's mouse and give your Amiga or Atari ST a whole new lease of life! 2x 2.54mm jumpers. Commodore CDTV very good condition. A few marks on the main unit and the mouse doesn't seem to work, although you can use the remote for mouse functions. Amiga USB Mouse Adapter Made in UK. This model also fits the Amiga 600 mouse port due to it's compact size. This adapter Allows for faster, smoother and more accurate and comfortable mouse operation on the Amiga using mice with modern optical sensors. Commodore Amiga A600 boxed with cables and mouse. Condition is Used. Slight yellowing to keys. Floopy drive a bit temperamental, may just need a clean? Good condition for age. Includes all manuals. Fitted with a 1 Meg Chipram expansion, and kickstart 3.1 rom fitted. Old kickstrart 2.04 rom chip included in box. AMIGA & ATARI ST, TT. Works with any AMIGA and ATARI ST (with 9 pin socket) model! & analog Joystick. Can be easier?. Led indicator, now you know is it works fine! Really smooth working, better than original mouse! Ideal for those of you running 1 or more Retro PC/Amiga etc. system that uses these connections. - 1 working Belkin Omnicube 2 way KVM switch. keyboard, mouse, vga cable to monitor/monitor or TV. Each mouse tested using the amiga system test/check disk. It feels funny in my hand. I will do my best to answer. I cannot test any of the above I can only test that it works and the functions are correct. Two Adapters are supplied one for Atari and one for Amiga. port on the STFM, STE or Amiga 600. - Most Compact Adapters Available, less than 5cm in length -.